Take a spacious, family-friendly sedan, add a healthy dose of luxury and you've got the 2017 Hyundai Azera. In spite of its budget-friendly price tag, the Azera feels like a luxury car. This large sedan bests competitors with its roomy cabin, which, in addition to abundant elbowroom, also boasts standard leather upholstery and high-tech safety gear, like blind-spot monitoring. The 2017 Hyundai Azera is your first stop for uncommon luxury at a great rate. 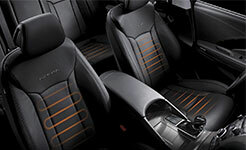 All models come with leather upholstery, dressing up the cabin in a stylish fashion. You'll also get heated and ventilated front seats, which prove their worth in extreme weather by keeping you content for the long haul. Of course, the Azera is also big on family friendliness. It's spacious, with head and leg room to spare and plenty of space for your kids to grow in continued comfort. The trunk's 16.3 cubic feet give you the ability to haul all your favorite sports equipment and all the necessary gear for any outings. Tech-savvy drivers and their companions will appreciate the Azera's take on infotainment. 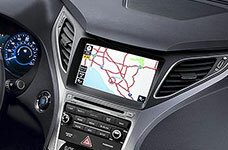 The Blue Link system is easy to use - the 8-inch touchscreen features graphics that are easy to read without distracting you from the traffic up ahead. It also comes with Apple CarPlay and Android Auto, which means you can interact with smartphone features right from the dash's central touchscreen. All models come with the premium 14-speaker Infinity audio system and satellite radio, turning road trips into the perfect opportunity to impress your friends with your taste in music. When other sedans offer 6 and 8 speaker options, the Hyundai clearly stands out in the crowd. The Azera has a sparkling reputation for safety. The Insurance Institute for Highway Safety gave the 2017 Hyundai Azera its top score of "Good" in a number of crash tests. Driver aids, like the blind-spot monitoring system, come in handy when it comes time to switch lanes in busy highway traffic. The rear cross-traffic alert system is also standard, and it lets you know if any cars are headed your way before you back out of a parking spot. The forward collision warning system is another boon for modern drivers, alerting you to an oncoming crash so you can slow down to mitigate or avoid damages altogether. Hit up the 2017 Hyundai Azera for a confident, composed highway ride and thrifty fuel economy ratings. Depending on which model you select, the Azera earns up to 20 city/28 highway mpg. When it's time to get up to speed - like in a merging situation - the Azera readily complies. It also feels incredibly smooth, not unlike a flagship luxury car. For a large sedan, that's quite an impressive blend of power and fuel economy. The 2017 Hyundai Azera was designed to deliver large amounts of luxury, so, naturally, the top-trim Azera Limited takes everything to another level. 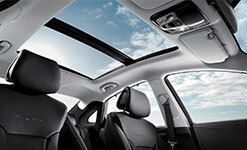 Its exclusive features include a power rear sunshade, which keeps the cabin cool when summer hits hard. This model will also offer major appeal to safety buffs. Its standard lineup includes just about every imaginable safety aid, including forward collision warning to let you know when you need to slow down to avoid a crash. Light up the cabin with this expansive view of the sky above. Inside the Azera, it's always the perfect temperature. Kick back and enjoy the ride with head and leg room to spare. Spot-on directions take you to your heart's latest desire. For a long list of tech features and standard luxury items - including soft leather upholstery - the 2017 Hyundai Azera is a no-brainer. Thanks to its best-in-class cabin volume, the entire family has enough room to get through a string of errands without a single complaint about cramped legs or shoulders. The Azera is also a premium choice for commuters, because it supplies highway-friendly speed and wallet-friendly fuel economy. Finally, the Azera's safety gear puts you one step ahead of danger, helping you avoid accidents. This unexpected contender in the sedan market truly delivers.